The Guardians are regrouping. Drax and Quill really want to go back to Spartax and save Gamora. 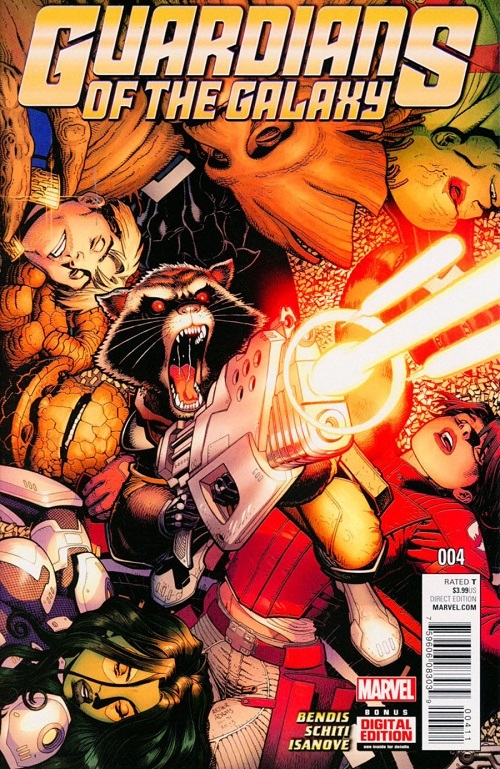 Rocket wants to do that too, but only once they have an actual plan. 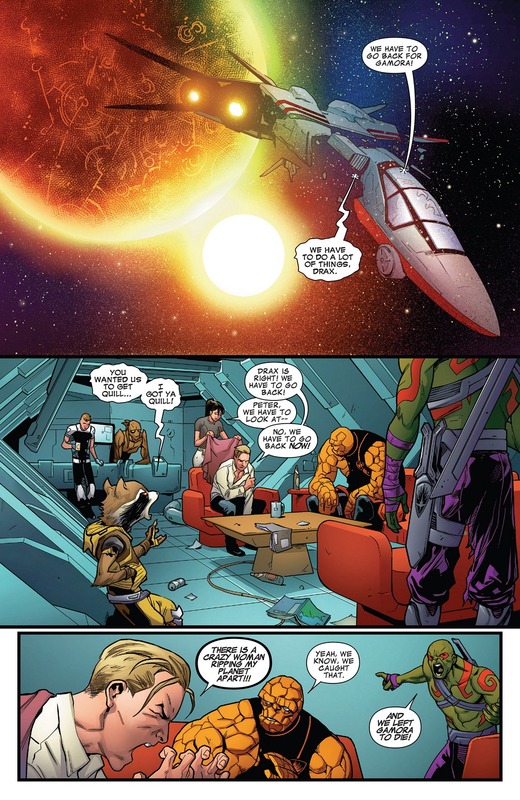 Quill is also motivated by not wanting the planet he is in charge of to be destroyed. 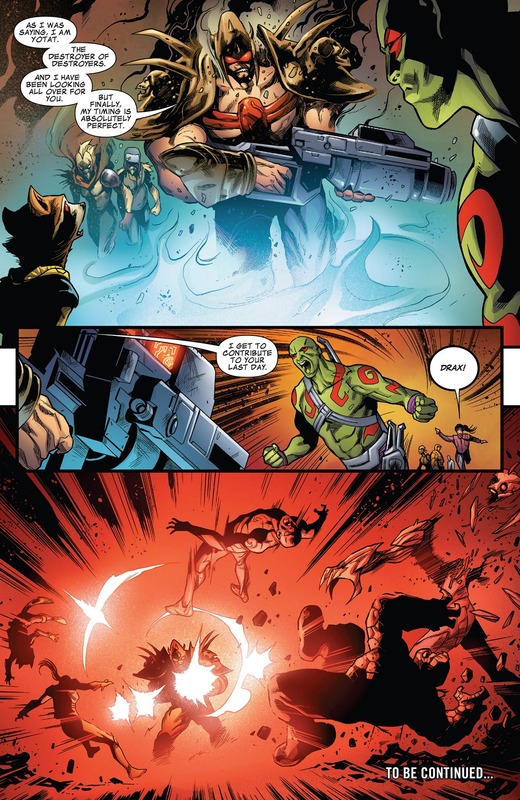 Drax doesn’t want to live a friend behind, on a live battlefield. I get the impression that Pryde is on Rocket’s side. Spartax. Where Gamora was Left to Die. (Depending on your point of view.) Gamora, to her credit, stands and prepares to fight Hala for a third round. 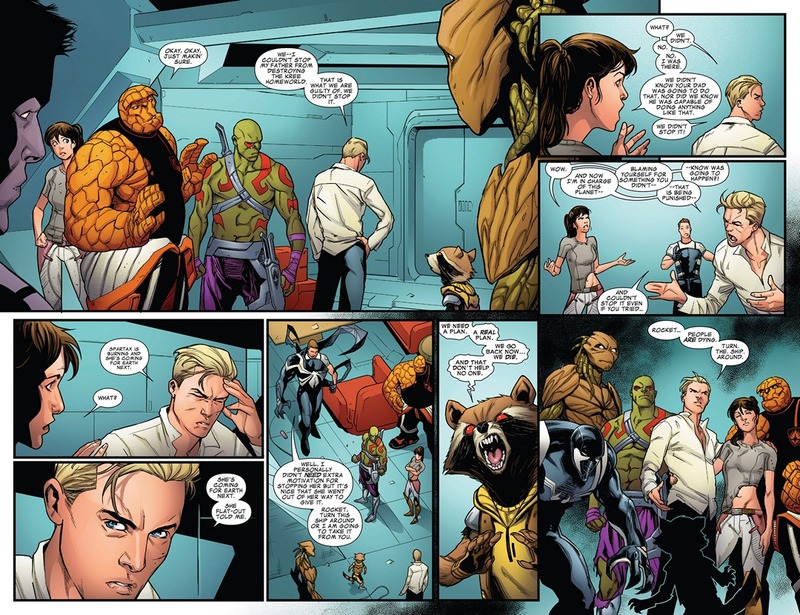 The team are making arguments of why they should go back and save Gamora. Rocket has to repeat, that they need a plan first. That is all he is trying to convey. Grimm, who wasn’t around during Black Vortex, has to ask the question. Did they destroy Hala? I love how angry the dudes get over the question. Quill taking the pause, before fully explaining the situation. They didn’t destroy the planet, they just didn’t save it. 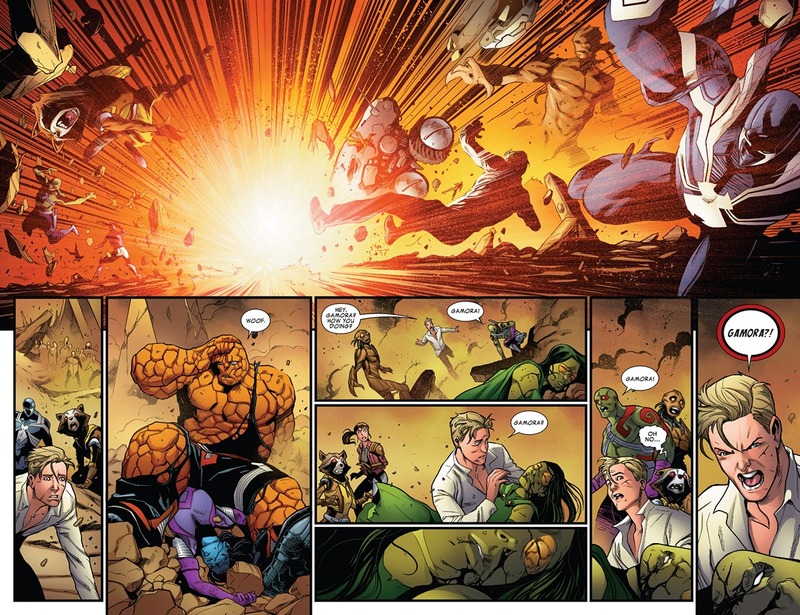 Quill’s father pressed a button and Hala (the planet, and thorneworld of the Kree) was destroyed. Pryde tries to relieve the guilt Quill is feeling. I do like how Quill, though he may hate the administrative tasks of being the president of a student, he actually cares for his citizens. Is this what happened between the eight months? Quill pushing her away to get more involved with the planet? She didn’t want to be seen as First-Lady-In-Wait so started hanging out with the Guardians? I could see that being the issue, or the beginning of the issues. I suspect we are never going to find out what happened during the missing eight months. Or, all of the Marvel titles are going to have their third or fifth storylines, deal with the missing months. Quill whispers that Earth is next on Hala’s hit list. This makes Pryde, Grimm and Venom committed to stopping Hala, even more. 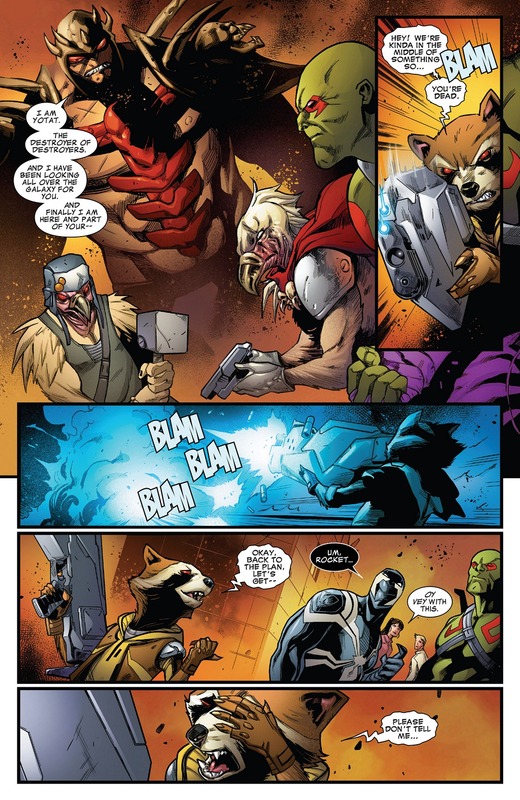 Finally, the entire team tells Rocket that they are going back to Spartax. On Spartax, Hala is beating Gamora even beyond the beating from before. Hala keeps asking where is King Peter Quill. King Quill finally states that he is there. Quill tries to charm Hala, to no effect. Rocket is wearing a cute hoodie, that has room for his ears. Quill tells Hala that it was his father who destroyed her planet. She understands this new information but it doesn’t change anything. See how cute that hoodie is? 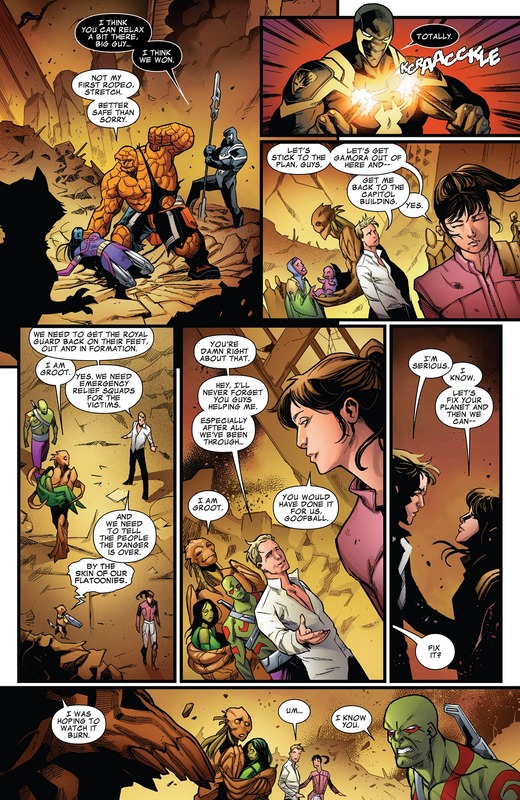 Quill tries to further explain that J-Son wouldn’t care if the planet that rejected him, was destroyed. She’s committed to her plan. Quill gives Pryde the command and Pryde strikes! 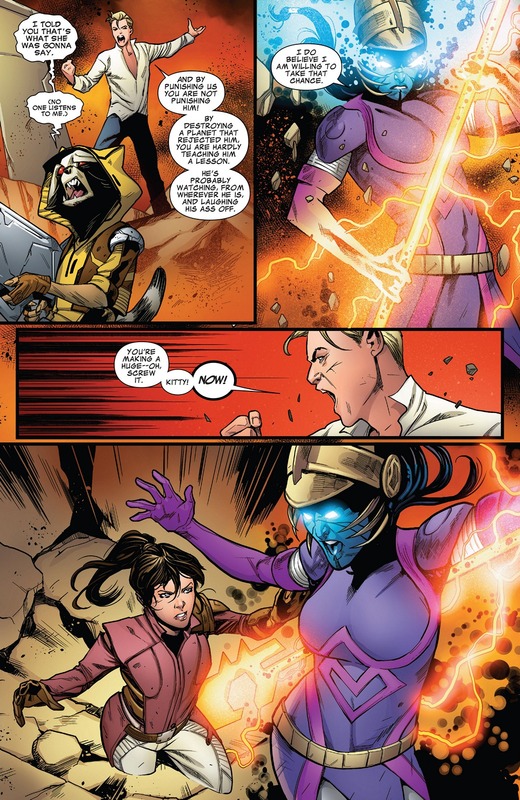 Pryde pulls the same trick she did to Thor in Thor 427 / 428, where she phases a person into the ground. Which I’m surprised this doesn’t straight kills the person but we can’t be having Pryde murdering people using a planet. To Hala’s credit, she doesn’t seem that wounded. 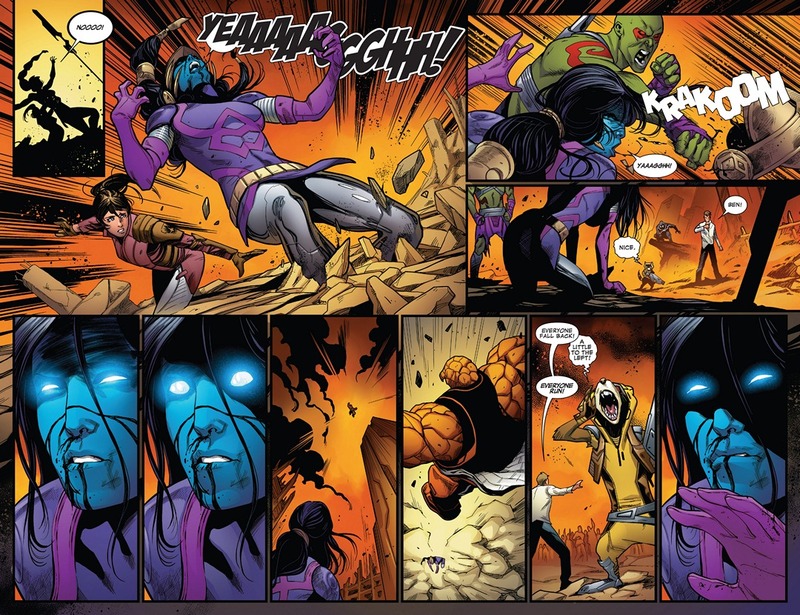 It isn’t until the combined might of Drax and Grimm start slugging her, that she starts to bleed. Hala explodes the ground around her. Everyone is knocked back. 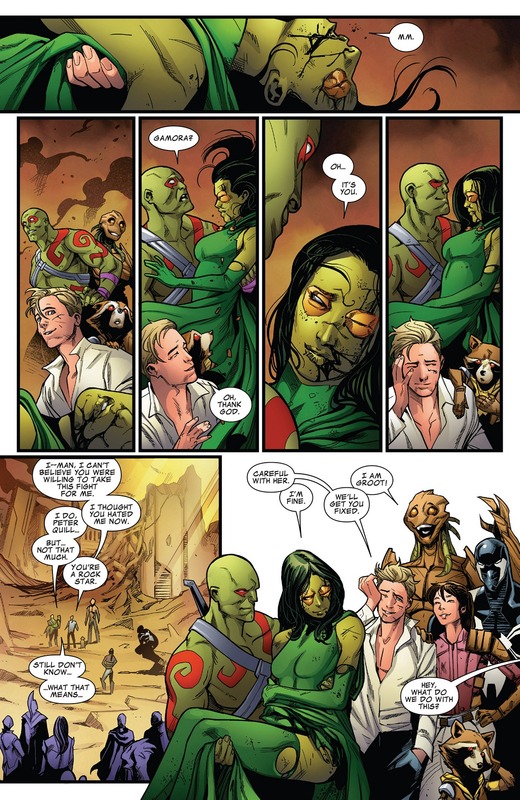 Is it me or is Quill overly concerned for Gamora’s health? Is that what happened between him and Pryde? Maybe I’m just looking for clues everywhere I can find them. Gamora isn’t dead. Everyone is so glad to see her breathing. Grimm has been spending this time, punching Hala’s face. Quill wants to get the planet back in order, which seems to upset Pryde. I do like how Quill already has a plan to get the military back up on their feet. I do like that panel of Pryde and Quill getting close, so those two are still sweet on each other. As soon as one threat is down, Yotat, the Destroyer of Destroyers arrives. Rocket opens fire on Yotat, thinking the threat is taken care of. Yotat still stands and it is his turn to unload his gun. The Guardians are knocked back, yet again. Pretty good conclusion to the first arc. Though I imagine Yotat and Hala team-up and this storyline isn’t over yet.